Why is that I don’t want to raise taxes? Why don’t I want to raise taxes on people? And actually, you said it back in 2010. You said, look, I’m going to extend the tax policies that we have. Now, I’m not going to raise taxes on anyone because when the economy’s growing slow like this, when we're in recession you shouldn't raise taxes on anyone. Well, the economy is still growing slow. As a matter of fact, it’s growing much more slowly now than when you made that statement. And so if you believe the same thing, you just don’t want to raise taxes on people. 1.) The United States wasn’t in recession in 2010. It was in recovery. A weak recovery, to be sure, but by the start of 2010 the recession had been over for more than six months. Why would Obama be talking about what you do in a recession when the recession was over? That doesn’t make sense! 2.) The White House’s 2011 budget, introduced in Feb. 2010, called for extending the Bush tax cuts on incomes up to $250,000, just as Obama wants to do today. Effectively, Obama was calling for a tax increase. Congress blocked it. 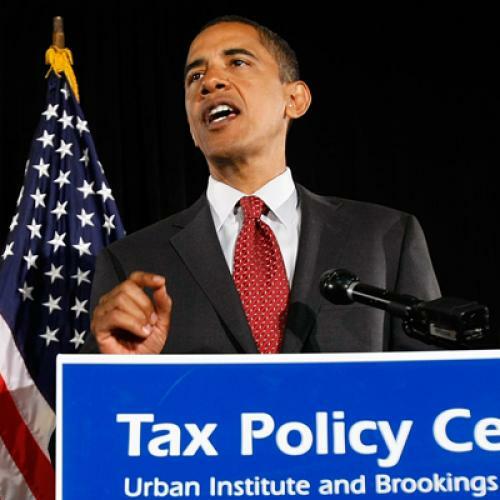 Why would Obama say that it's unwise to raise taxes when he he was trying ... to raise taxes? That doesn’t make sense either! That's when I decided to find out when Obama said what Romney said he said. Easy enough to do, because it went viral on You Tube (see below). It wasn’t 2010, as Romney said. It was Aug. 2009. That may not sound like a big, lying difference, but it is. In Aug. 2009 everybody thought we were still in recession. We weren’t (the economy hit bottom in June 2009), but we wouldn’t find that out until one month later, when the National Bureau of Economic Research (the official recession scorekeeper) announced that the recovery was underway. Moreover, Obama didn’t say “I’m not going to raise taxes,” as Romney claims. He said, “Normally you don't raise taxes in a recession. Which is why we haven’t. And why we've instead cut taxes.” When pressed by NBC's Chuck Todd that the not-yet-passed health care bill might raise taxes on the wealthy (as it did in the end; weirdly, the provision raised little ruckus from the right when introduced in 2010) Obama very sensibly replied, “We have not proposed a tax hike for the wealthy that would take effect in the middle of a recession. Even the proposals that have come out of Congress—which, by the way, were different from the proposals I've put forward—still wouldn’t kick in until after the recession was over.” And indeed, Obamacare’s new Medicare tax hike on incomes above $250,000 won't kick in until Jan. 2013. The economy isn’t growing very quickly, and it’s true that during this past quarter the economy grew more slowly than it did throughout 2010. But it grew, as economies do when they're in recovery. It didn’t shrink, as economies do when they're in recession. Obama made his statement when he thought the economy was in recession, and he made it retrospectively, and within one month we’d all know the economy was in recovery, and within six months Obama would be proposing a tax increase that he continues to favor today. There is absolutely no contradiction in any of this. The question remains: Is it unwise to raise taxes during a weak recovery? Conceivably it can be, but it’s hard to find evidence that it is. The last significant tax hike occurred in 1993 under Bill Clinton, during a similarly weak economic recovery. The economy boomed. Conservatives like to argue that it boomed because Clinton (under heavy pressure from a Republican Congress) cut the capital gains rate in 1997. But the cut didn't take effect until 1998, by which time the tech boom was well underway. Indeed, the Congressional Research Service recently issued a report saying it could find no correlation between tax rates and economic performance going all the way back to 1945. “Analysis of such data,” CRS said, “suggests the reduction in the top tax rates have had little association with saving, investment, or productivity growth.” For all we know, even raising taxes during a recession isn’t necessarily harmful.